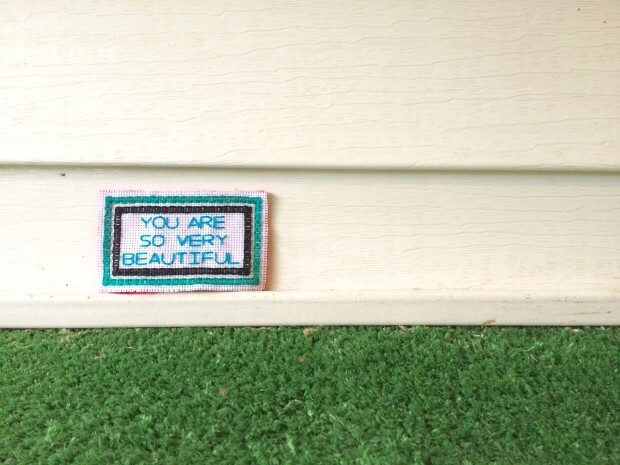 You Are So Very Beautiful - craftivism. In 2015, I started writing affirmations. They pushed me to see I was beautiful, capable, worthy, enough, smart, and other permutations. And in homage to the work of the late Susan O’Malley, I envisioned a project where I stitched the affirmations so many of us need to hear… and then left them for people to find for themselves, to hear what they maybe needed to hear. I wanted to be an outpouring of kindness as I healed my own heart, because I knew that just as much as I needed to heal, others did too. Because craftivism is as much about fighting the bad things of this world as it is about fighting the bad things we tell ourselves. We live in a world where the media constantly tries to tell us what is in, out, cool, passé. Every day we have to fight to remember that we are enough just as we are, we are beautiful just as we are. Some days, though, we forget. And those days can drag on into weeks and months. Leaving our souls sucked and dry, leaving us husks of what we were as children, back when we knew we were amazing. It’s time to remind both ourselves and others of just how wonderful we all inherently are. It’s time to let our acts of stitching go by leaving them in places for someone to find, someone who needs to hear those words just as you do, if not more. As craftivism is about healing ourselves as we make, and then healing the world with our products, let’s get to it. For details on how you can get involved, click over here.